Before you begin recording your show you will need to create a set. A set contains information about the event and the recording. Once you've added a set you'll be able to record to it from the Studio app. In the Artist Dashboard homepage click the “+ Add a Set” button or click “Create a New Set” in the Actions section to create a new set. First, you’ll need to decide the initial state of the set. If you’re ready to promote and collect pre-orders for the recording, selecting Public will make the set visible on your Artist Profile page. If you’re not sure if you want to let everyone know about the set, selecting the Draft status will hide the set on your Artist Profile page as if it didn’t exist. 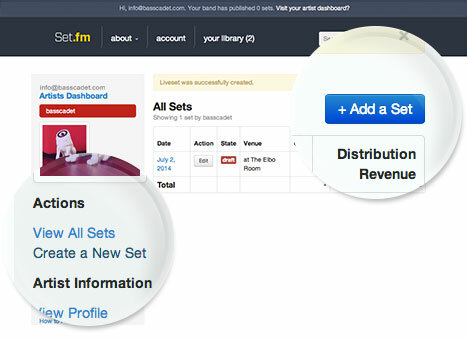 Set.fm recommends picking a price that’s 1/4 to 1/3 the face value of the ticket to the show. You can even give it away for free. Regardless of price, fans can give you an optional tip in addition to the price of the set. Assign the venue in the Where field of the set. Once you begin typing Set.fm searches Google for a matching venue. If it can't find the location, you can create your own custom venue. Enter the date, time, and length of the event in the When field - the time of the event should be the actual date and time. The Description should include general information about the event. If this show is extra special or different in some way from other shows, you should mention how. The legal notice outlines some terms that you, the Artist, must be aware of and approve of. Most importantly, in order to distribute the recording through Set.fm, you must grant Set.fm approval to do this. You must check “I accept the above terms.” to continue creating the set. After you’ve completed the information for your show, go ahead and click the “Create the Show” button to save your set. Audio will be added directly through the Set.fm studio app or by directly uploading an MP3 file.